With Glittering Eyes: Operation Beautiful. A few months ago, I heard about the project called "Operation Beautiful". 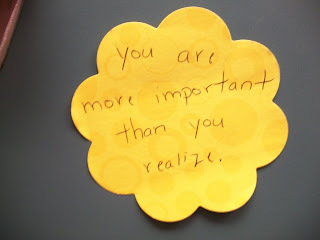 The idea is to carry sticky notes with you wherever you go, and when you in a public place/restroom, to write one and leave it there that says something like..
"You are more important than you realize." I carry sticky notes with me wherever I go, but I don't often find myself in a public restroom. Even when I am in a public restroom, I don't always remember. However, today in Meijer I did! aaaand, I had my camera with me. aaaand, it had batteries that weren't dead in it. aaaand, no one else was in the bathroom. So I decided to document my sneaky attempt to love others. Here it is! Check out the website and consider joining the movement. It's really fun and it makes me wonder who has found the notes I have left and if it has made them smile or feel more important or beautiful. Everyone needs an encouraging word. 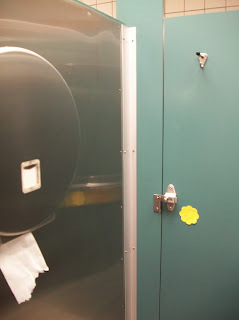 Even if it's just a sticky note in a bathroom stall. I am going to start doing it too here in France. Vous etes belle!